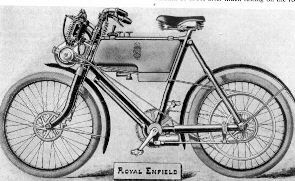 RoyalEnfields.com: FLASH from the past: Britain to build motorcycles! FLASH from the past: Britain to build motorcycles! This may be the 1901 (or maybe '02) Royal Enfield motorcycle. Oddly, it has a high mounted front engine with rear drive! Breaking news: "BRITISH MOTOCYCLE BOOM; England's Biggest Makers Announce That They will Build Motocycles." That's from the magazine The Bicycling World, Volume 44 No. 6, of Nov. 7, 1901, spotted it in the Smithsonian Institution Libraries collection. The article is a column about prospects for the motor bicycle — what we would call a motorcycle. Dateline: "London, Oct. 23 — Not less than twenty-three well known cycle manufacturing firms will make motor bicycles next year; in many cases the designs are well in hand, so that the machines will be on view at the forthcoming cycle shows." The only brand actually mentioned is the Raleigh Cycle Co. But we can assume Royal Enfield was one of the 23. "The year 1901 is motorcycle genesis for Royal Enfield," Jorge Pullin writes in his Royal Enfield Virtual Museum. What machines were in store for Britain's growing number of enthusiastic motor bicyclists? The primary controversy seems to be whether the motors will be placed "high" and power the front wheel, or "low" and power the rear. The unnamed author takes the view that rear drive might be best for "winter work" on "greasy" roads. The rest of the article is just as prescient — for instance, on the subject of relations between motorcycles and automobiles. "It has now become quite clear that the Automobile Club is desirous of dropping the connection of such mere worms as motocyclists..." he writes. "It has for some time past been pretty evident that the club does not regard the motocyclist with much favor, and I fancy that the same thing applies to owners of small cars. The fact is that some of the officials are suffering from tight hats, and are pinning too much faith on the aristocratic support accorded to the club. They should, however, remember that no patronage is so fickle as that of English society people, who try every new thing in turn, not out of love for it, but simply to kill time." "We have not the slightest doubt about the future of the motor bicycle, and from absolute experience can recommend them to all who can afford their purchase." Well they finally decided on the engine position David (within the frame) when the number of crashes caused by the heavily unbalanced steering due to the engine ahead if the bars began to cause concern. Thereafter the design layout of the motor bike did not really change or improve until well after the Second World War.